It's been a long weekend and I'm beat, so this post will be short and sweet. And roasty toasty delicious. Last week I saw the roasting chickens at Whole Foods and decided to give one a try. I picked a nice, beautiful 4-pound baby. I thought about asking the butcher to cut it up for me, but I had a ride that I didn't want to keep waiting too long and decided I would have more options if I kept it whole. 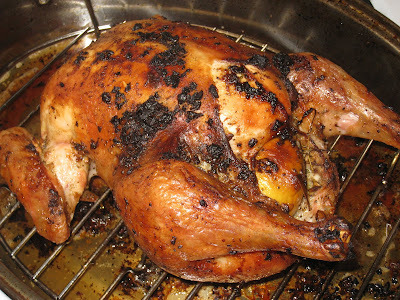 My last serious attempt at roasting a chicken, while not exactly disastrous, was less than satisfactory. Considering how much lemon, thyme, paprika, and other spices went into it, the bird was bland. I don't think the problem was necessarily with the recipe; at the time I chalked it down to my lack of experience with the roasting technique. I thought it was time to try again. I went online to see if I could find something that seemed reasonable. I finally ended up at this recipe at The Food Network website by Emeril Lagasse, of all people. What I found particularly amusing about this recipe is that, while the ingredients and the basic instructions seem like they would work, the instructions are to roast the chicken in a 500 deg. F oven for 40-50 minutes. That just looked wrong, so I decided to check the reviews and see what people had to say about it. The overwhelming majority of reviewers gave the recipe 5 stars, but they all also said they either burned the chicken the first time they made it, and then cooked it at a lower temperature with excellent results, or they had read previous reviews and knew to cook it at a lower temperature. The highlight was when one reviewer criticized the other reviewers for giving the recipe such a high rating when it had such a serious mistake in it. Because it is clearly a mistake, of which the site is unaware, or about which the site does not care. I was quite pleased with the result. As you can see, the garlic burned to a crisp, but the skin was crisp and full of flavor, as was the meat itself. I ate the dark meat for a couple of dinners and I chopped and froze the chicken breast for some soup I wanted to make. The bones are in a resealable bag in the freezer, where it is their destiny to become a lovely golden slow cooker chicken stock. I stuffed every fresh herb from my refrigerator into this bird, including a big old bunch of cilantro. I also used the Bell's Natural Seasoning in the rub. All in all, it was one of the best chickens I have ever eaten, and it was definitely the best chicken I have ever roasted. In a small bowl, combine the butter, olive oil, Bell's Natural seasoning, and garlic and mix well. Squeeze the juice from the lemon into the bowl and mix it in. Season the chicken liberally with salt and pepper on all sides, and place on a rack in a roasting pan. Place one of the squeezed lemon halves inside of the cavity, and then add the thyme, sage, cilantro and bay leaves, followed by the second squeezed lemon half. Rub the butter-oil-garlic mixture all over the outside of the chicken and in between the meat and the skin. Place on a rack in the middle of the oven. Bake for approximately one-and-a-half hours, until the internal temperature of the thickest part of the leg is 160 degrees. Check after an hour, and if the skin starts turning too brown, place a piece of aluminum foil loosely over the breast. Remove from the oven and let the chicken rest for 10 to 15 minutes before carving. That chicken looks like it's ready to party.